If you are familiar with my blog and myself you will be well aware that I love a good haul. 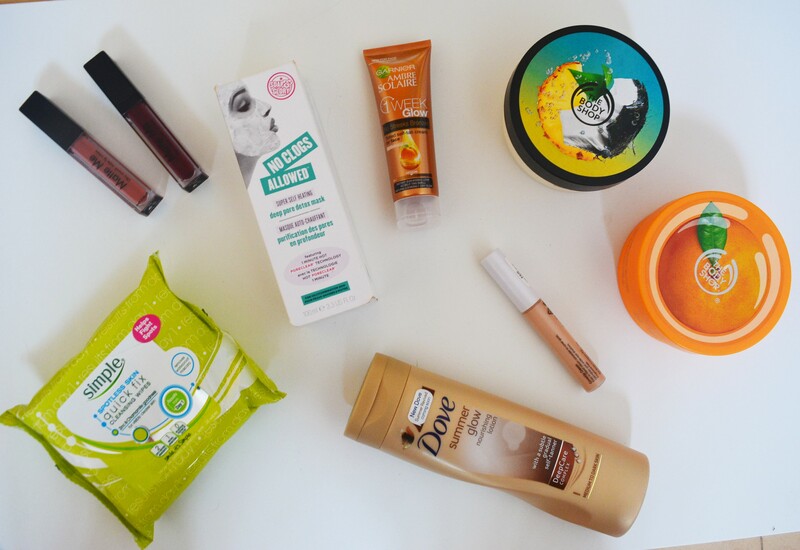 I only recently did my Giant Beauty Haul but, this time I have something a little more…epic. I won’t lie but i have missed out a few things from this haul. Things like clothes, doubles of things, vegan mayo and salad cream and some more food items were excluded. Not because I was ashamed of them but because I may do a haul with them in the future. Anyway! 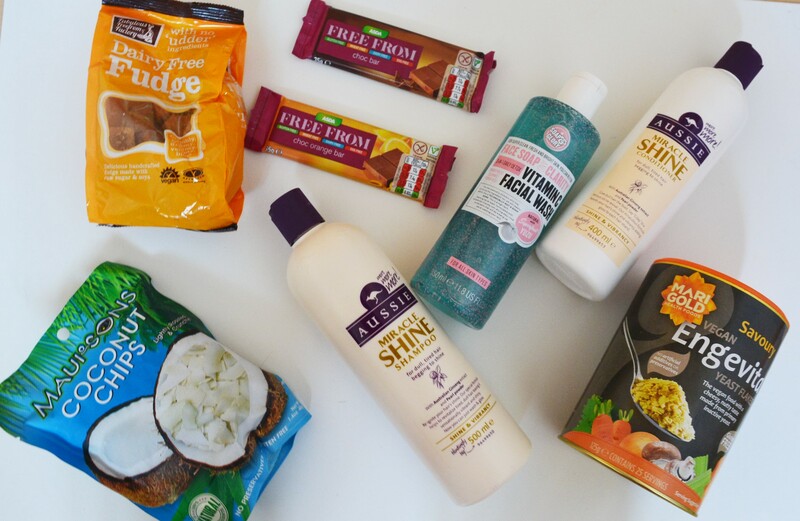 My plan for this post was to show you all of my new beauty, skincare and food things in a huge condensed haul. I’m not going to talk in depth about each product, you know i like to really get stuck in and review them individually so, I apologize about that. I’m so excited to get this started so, let’s get on! In top left hand corner you will see my two new sleek matte me lip creams. I did a whole review on these two bad boys here, that you can check out here if you wish. In short, I did prefer petal to ‘vino tinto’ but, overall i am ecstatic about them. The Ambre solaire one week glow was another whim purchase. My mum actually talked me in to this one. I never, ever tan my face so i never seem to quite match. This summer I have decided to stop being a laughing stock and do something about it and decided on this facial tanner. The body shop ‘Piñita colada’ and ‘Satsuma’ are going to have their own website dedicated to them. I absolutely cannot get enough of the smell and can literally sit sniffing all day long…I am however going to do an in depth, detailed review about them and how i managed to buy them. The concealer laying delicately next to the body shop lotions is from ‘Collection’ at boots. I have wanted to try it for ages and seemed a shame to walk past it and not pick it up considering how cheap it is. I got it in the shade ‘fair’ (it was the only shade available!) but I will have some things to say about it in the near future. At the bottom is the Dove summer glow body lotion. It’s meant to give you a natural, all year round glow. It was really cheap and seemed perfect for me. Finally, is the Simple quick fix cleansing wipes. These are meant to give you visibly clearer skin after one use. I have changed my skincare routine AGAIN so, an updated version will be hitting this blog shortly. 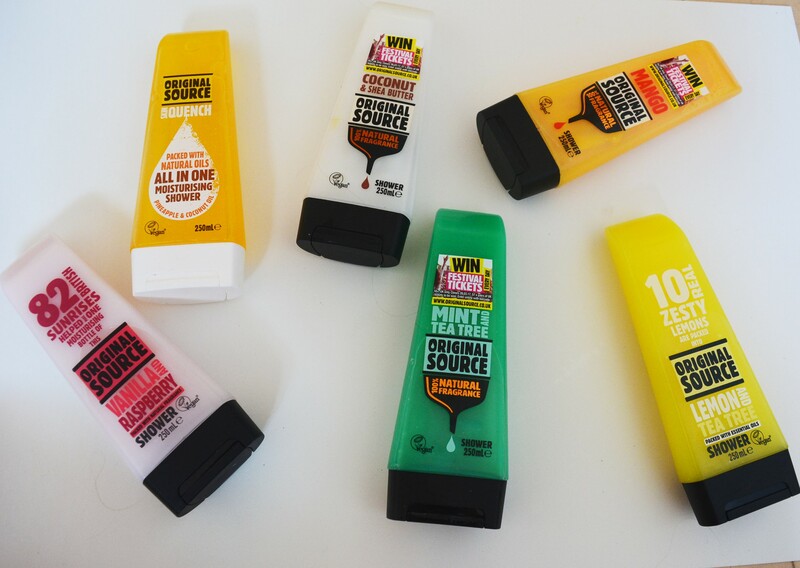 I am sorry to announce that I went a little overboard with original source and their delicious shower gels. I also bought the hand wash but decided not to include it in case you thought i had finally lost it. You may know I sheepishly bought the ‘grapefruit’ original source in my giant beauty haul. This one little purchase turned in to this huge purchase and I regret nothing. I wasn’t going to but since writing this post i have decided to do a whole blog post dedicated to them all. But, if you are considering buying any I would definitely opt for Pineapple And Coconut or Mint And Tea Tree!! Finally we have some foodie bits and the last of my body/skincare. …This saddened me when I thought of never eating fudge again (selfish I absolutely know!). Whilst browsing around Asda I came across the ‘free from’ aisle. I set my eyes upon these and had absolutely no hope that they would taste of anything. I took them home, I opened them up and laughed about how rubbish they would probably taste, I even handed them out! However, once i took that first bite, tears rose up in to my eyes and i quickly snatched away all of my fudge handouts. It was beyond delicious and I had to savor it. I cannot explain to you how nice this dairy free fudge is. Okay it’s not healthy but, it’s vegan and tastes just like fudge. The moral of my very long, emotional story is to try it because you will be extremely shocked! Moving on from that emotional episode is the free from chocolate bars. I had seen someone on my twitter talking about these and had to try them out. Unlike the fudge story, i didn’t just buy one bar, I bought 8. They are incredible and taste so good. The soap and glory vitamin facial wash will be having its own review. Let’s just say, it burnt my lip. The two Aussie shampoo and conditioners are giant. They may not come across in the photo but the shampoo is a whopping 500ml. I have never seen Aussie have a sale on these ginormous bottles of loveliness so, they had to be put in my basket. The yeast flakes. These were so cheap and are so nutritious and tasty. I didn’t think they would add much to my food but, i have made vegan mac and cheese and vegan spaghetti bolognese so far and adding a few sprinkles of this stuff adds a cheesy taste. They are vegan and perfect if you’re lactose intolerant, vegan or dairy free. Finally we have the coconut chips. I love love love these. They aren’t extremely healthy but they are such a nice snack, they are so sweet and I won’t lie, I do have about 6 packets in my cupboard. I really hope you enjoyed this huge beauty, skincare and food haul! If you did please let me know in the comments below and let me know your favorite item! Great Haul! Those original source products look interesting. And I love nutritional yeast – so tasty!